The California Energy Commission aims to take the equivalent of 115,000 fossil-fuel-powered vehicles off the road with the newly approved solar mandate passed on May 9, 2018. The goal is to cut more than 50 percent of home-energy use in Sacramento homes with mandatory inclusion of solar power systems on all newly built homes starting in 2020. This type of mandate is the first of its kind in the country! At West Coast Solar, we’re ecstatic to see the state getting behind renewable energy and solar power. We believe solar is the future of energy use. In this two-part blog series, we’ll share a brief overview of the 2019 Building Energy Efficiency Standards, answer some common questions, and introduce you to why it’s so important to go solar. If you’re ready to discuss installing a solar energy system on your home, give us a call today! Otherwise, continue reading to learn more. What are the 2019 Building Energy Efficiency Standards? The primary goal of California’s Energy Commission with the building energy efficiency standards is to enhance indoor and outdoor environmental quality through the reduction of wasteful, uneconomic, inefficient, or unnecessary consumption of energy. The 2019 Building Energy Efficiency Standards were adopted into the California Code of Regulations (Title 24, Part 6). The standards apply to new additions or alterations to buildings as well as newly constructed buildings beginning on Jan. 1, 2020. What’s new about the 2019 standards? There are a number of new additions to the 2019 standards. The most influential is the requirement of photovoltaic solar systems to be included in new home construction. You’ll also find that for the first time, the building standards address requirements like indoor air quality and energy efficiency for newly constructed healthcare facilities. For the residential sector, the 2019 standards strongly encourage the use of demand-responsive technologies, battery storage, and heat-pump water heaters to improve the building’s energy efficiency. The standard also encourages the upgrade to high-performance attics, walls, and windows for increased comfort and energy savings. The standards address lighting in non-residential buildings, updating the expectation for outdoor and indoor lighting to make maximum use of LED technology. For both non-residential and residential properties, the standards improve the air filters to trap hazardous particles and debris from entering the building through the ventilation systems. How much energy will be saved with the updated standards? It’s estimated that single-family homes built with the 2019 standards will use 7 percent less energy than buildings built with the 2016 standards. Factor in the use of photovoltaic, rooftop solar power systems, and the same single-family homes will see around 53 percent less energy use than other homes built with the 2016 standards. It’s estimated that 700,000 metric tons of greenhouse gas emissions over three years will be eliminated under the new 2019 standards. 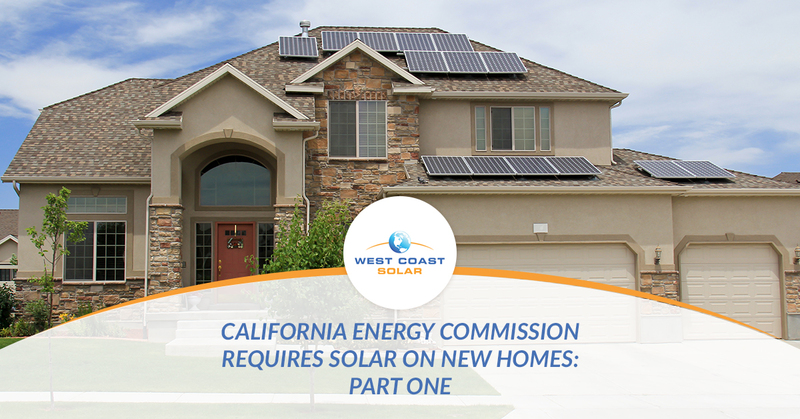 Choose West Coast Solar for your solar installation! What better way is there to save money on your utility bill, help the environment, and create a better future for your family, friends, and community than by making the switch to solar power? At West Coast Solar, it’s hard to beat renewable energy when it comes to the micro and macro benefits of making the switch. In part two of this blog series, we’ll answer three more common questions about the 2019 Building Energy Efficiency Standards and share why it’s important to go solar. If you’re ready to discuss installing solar on your home, give us a call today!